Dave over at Surly Bikes can’t ride a bike right now because of a recent ankle injury. His doctor doesn’t want him putting a foot down and risking a re-injury. Right turns took a little practice, as did getting used to a 4-foot wide profile in traffic, but he’s taking to it, and the StokeMonkey means he can usually ease up on the injured leg. 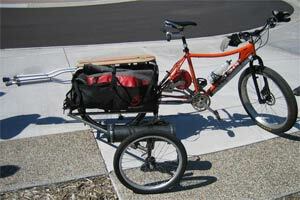 Plus, the Xtracycle is great for carrying crutches. My rig has some inherent handling flaws. It will never be perfect. But it still beats the hell out of taking the bus or riding in a car. I’ve regained some of my freedom, and that is priceless.